96 percent of executives view ineffective communication as the primary reason for workplace failure. This figure shows that there is a dire need for customer support teams and others to communicate with one another effectively. Only then can they fulfil customer requirements; delighting them to do more business. A shared or collaborative email inbox plays a critical role in smoothening the process of communication. It helps to address the communication challenges that a company faces. Efficiently manage both internal and client interaction with this single and streamlined platform. A shared inbox is a team email management software designed to keep all your agents on the same page. As a business that caters to the customer service industry, faster ticket resolution is crucial and shared inbox makes this possible. A single mailbox helps agents to resolve tickets faster, as they can see who is working on what and assign tickets to the appropriate agent. It also allows managers to reduce ticket resolution time by ticket prioritization, labelling, and marking. With a shared inbox in place, managers and system administrators can assign tickets, in need of urgent attention, to the right support agent. In absence of a single mailbox, sending timely responses to customers becomes difficult. When customers receive timely responses for their queries and requests, they feel delighted and remain loyal to your brand. As a business, you realize the significance of retaining customers. Losing customers adds to your business cost and this affects your profits. According to a Bain and Company’s report, a 5 percent increase in customer retention rate leads to more than 25 percent increase in profits. Now that we have realized the need to own a shared inbox let us learn the key benefits of a customer-facing mailbox. Shared inbox provides a single dashboard overview to businesses for all customer tickets and their status updates. 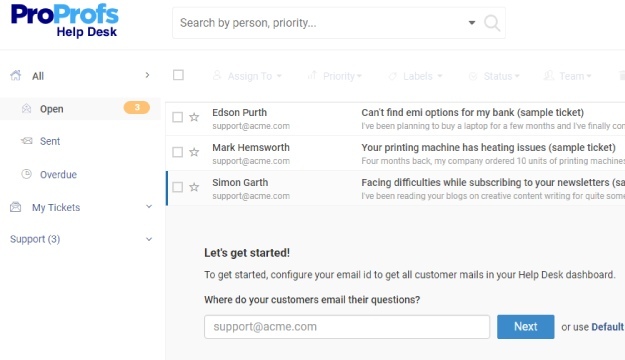 With a single inbox in place, your agents can easily access and efficiently manage all customer-facing inboxes, such as [email protected], [email protected], [email protected], [email protected], and [email protected] Agents can see who is working on which ticket, organize and assign tickets to the concerned individuals and teams. Also, tracking emails from a simple, single email-like interface leave customer support teams with no longer cc emails. Shared inbox makes collaborative teamwork and ticket prioritization possible. It stands for effective email management. One of the key benefits of a single inbox is that it helps newly onboarding support staff to access existing customer emails. As a business, you comprehend the significance of good onboarding. 69 percent of new employees are likely to stick around for three years with great onboarding experience. 20 percent of employee turnover happens within the first 45 days of a person’s term in the office. 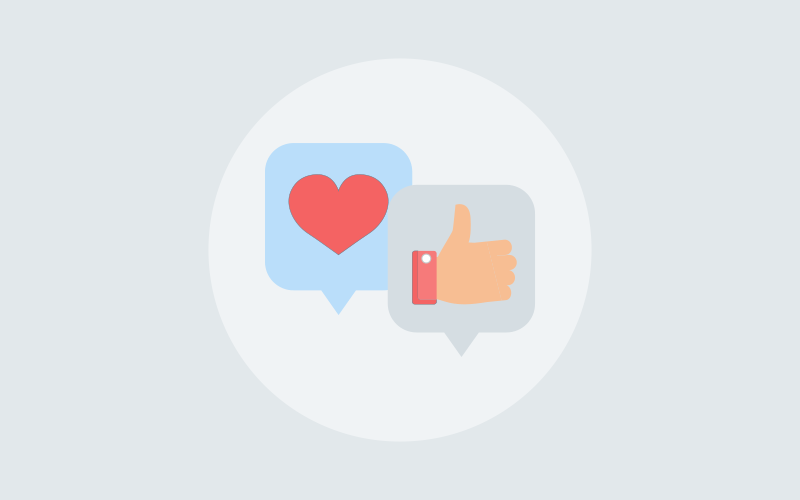 When you use a shared inbox, onboarding new people on your team is no more challenging. As soon as you add a new joinee to the inbox, they get access to all the conversations. With this kind of access, your new teammate can quickly grasp how to deal with different types of messages and situations. They know whom to ask for help, and also replies that makes customers feel delighted. It is a safe bet for customer support teams to use canned responses. Providing canned responses to frequently asked questions is quick and convenient for both agents and customers. They are predetermined responses to questions generally asked by customers. 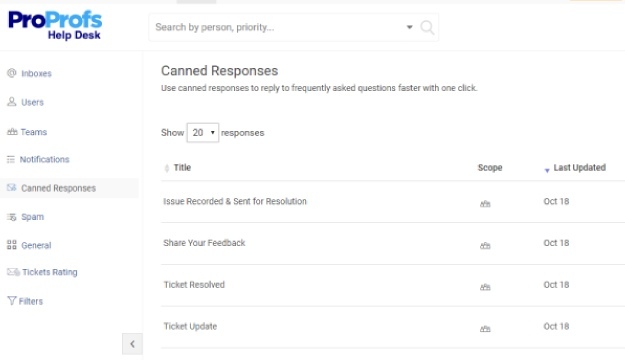 Canned responses and rule-based automated messages help agents to automatically communicate with customers at the time of ticket creation, update, assignment, and resolution. Besides, brand consistency comes handy with such responses. Why shared inbox has become so popular among businesses is because of the transparency that comes with it. With the sharing of e-mails, you make all the information available to everyone across teams; avoiding their frustration due to lack of visibility. Besides, agents can learn how to deal with different cases and customers. Collaborative emailing allows teams to enhance their teamwork; feeling collective ownership over all the emails. In words of Jason Cohen, Founder of Lokad, “With collective email ownership, there is no blame to be put on anyone. The team is here to diagnose what went wrong and how to do better when the same situation happens again”. Customer support teams benefit from the customer interactions and related information available to all. Transparency brings team efficiency and engagement. This transparent information makes teams efficient and engaging with the customers. Your agents become more productive than before when information flows through more parts of the company. They make better decisions, quick decisions, and that too, with more confidence. With a shared email account, teams can review each other’s emails and take the best out of everyone’s work. Remember every individual builds value for the organization. So, they should have access to all the customer conversations. A single inbox makes it easy for managers and system administrators to easily manage emails. As all emails can be viewed and accessed on the same screen, “admin” has the right to sort emails based on their categories and departments. They can create separate customer facing inboxes, such as product, billing, sales, contact, support, and help. Not only can they sort emails in accordance with departments but also, create various categories under a customer-facing inbox. A single mailbox lends the option to the system administrator to set up different roles and permissions. They can create users and organize them into teams. Doing so helps to easily manage roles, task assignments, and permissions. It is in the hands of the admin to permit an individual or team to access and work on a ticket. They may or may not grant permission to act on a ticket, considering the role and department of an employee in the organization. 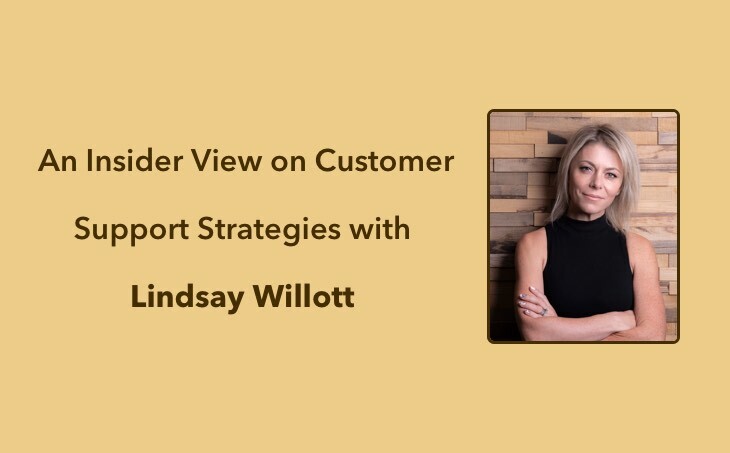 Having understood the relevance of sharing your inbox today, opting for a help desk ticketing system helps you deliver the ultimate customer experience. 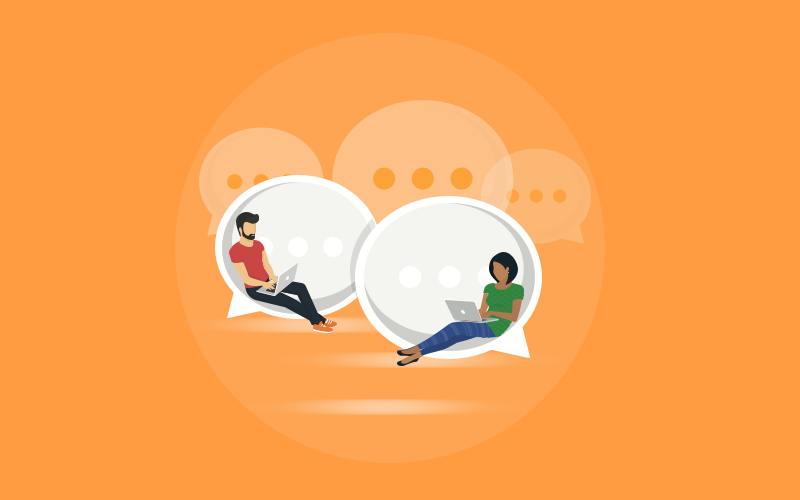 As your business grows, your customer support needs grow too, which is why considering help desk software with a shared inbox feature is a prudent decision. ProProfs Help Desk can be one of the considerations in this regard. 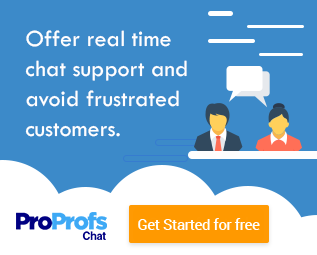 Ticketing software, like this, offers customer support ticket management, a knowledge base for self-support, and live chat instant support. To know more about ProProfs Help Desk, you may read the reviews online.